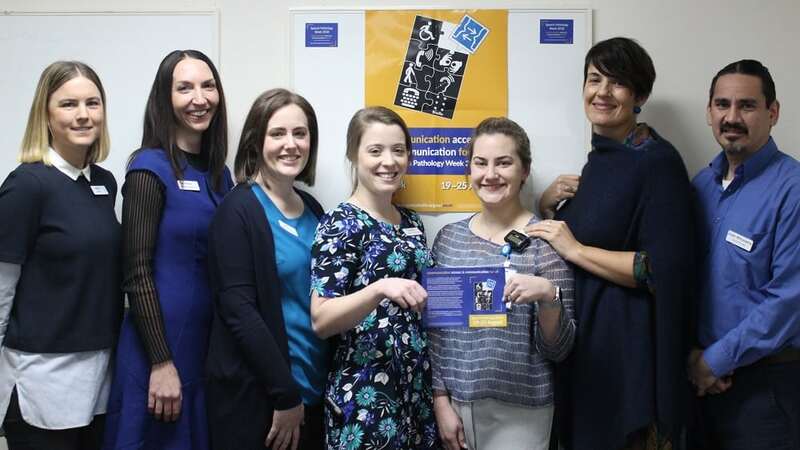 It’s Wear Blue Day at Northern Health’s Speech Pathology Department, supporting Speech Pathology Australia Week. This year, speech pathology professionals call for greater action to ensure accessibility for the 1.2 million Australians with a communication disability. Communication access is vital to enable everyone to participate fully in the social, educational, economic and sporting aspects of life. Emma Beer, Associate Director Allied Health Speech Pathology (CPSP), Audiology and Orthoptics at Northern Hospital says that they celebrate Speech Pathology Week every year with a different theme. This year, the focus is on communication access for all. “In a hospital setting, we have a lot of patients with communication problems from stroke who can’t communicate their needs. As speech pathologists, it’s important that we enable them to express themselves. We are all wearing blue today to draw attention to the importance of communication,” she said. Technology plays a growing role in keeping Australians with communication difficulties engaged with their family, friends and those in their local community. Assistive technology such as electronic and speech generating devices, voice amplification and computer access aids (including eye-gaze mouse control and head tracking devices) allow people with speech difficulties to communicate with those around them. Building communication accessibility will ensure that everyone is treated with dignity and respect. When we create communication accessible communities, everyone gets the message.